Celebrate Pit Bulls with a dog song at Talking Dogs. 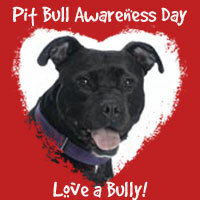 Today's featured dog music video is Pit Bulls Don't Cry. Grab a dog. A Pit Bull if you've got one! Sit. Stay. Snuggle with that dog and take a moment to groove along to Pit Bulls Don't Cry. Be sure to scroll down below today's feature and explore some barking good blogs because today is the Pet Bloggers Hop!